Alcoholic beverages namely table wines and fortified wines. 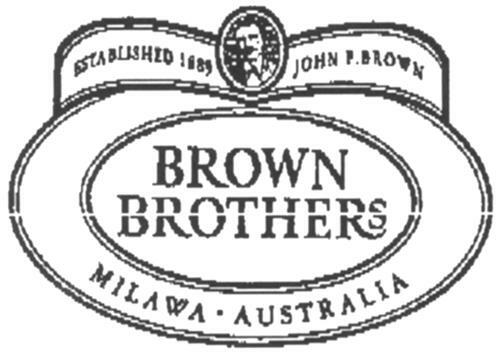 On Thursday, July 31, 2003, a canadian trademark registration was filed for the above pictured logo by Brown Brothers Milawa Vineyard Meadow Creek Road, Milawa, 3678 Victoria, AUSTRALIA . The Canadian IP office has given the trademark application number of 1186912. The current status of this trademark filing is Registration published. The correspondent listed for is LUDLOWLAW of 1530-439 University Avenue, Toronto, ONTARIO, CANADA M5G1Y8 The trademark is filed in the description of Alcoholic beverages namely table wines and fortified wines. .
Mark Disclaimer: The right to the exclusive use of the word AUSTRALIA is disclaimed apart from the trade-mark. (1) - Alcoholic beverages namely table wines and fortified wines.